One way to save money is to use reusable cleaning supplies instead of paper towels so I was happy to find these Absorbent Microfiber Cleaning Cloths by TowelLab. These microfiber cleaning cloths are super soft, but also very absorbent. We use them around the house for general cleaning of furniture, pictures, and windows. They are soft enough to use on the computers and television, too. They don’t leave any lint or streaks on windows. This package comes with 4 cloths. They are said to absorb 4 times their own weight in liquids and I would say that’s pretty accurate. They are lab tested to dry four times faster than cotton towels. My experience is that they do dry very quickly. I wring them out as much as possible and hang them up to dry. I like that they are also machine washable and reusable. But they are also soft and durable. 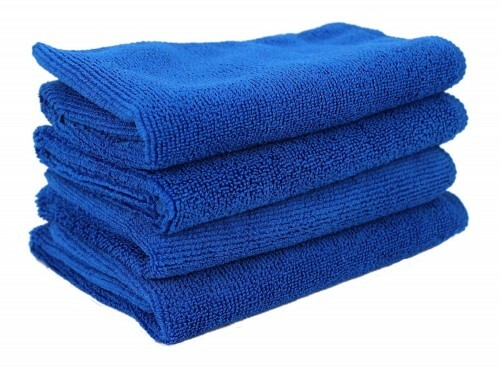 These royal blue cloths are 12″ x 12″ and are 100% microfiber comprised of an 80/20 blend of polyester and polyamide. For small households, this pack will last a long time. Our larger home could use a larger size pack, especially since I’m using them in the house and outside, too. You may purchase these using the following affiliate link. Using this affiliate link will not affect your cost, but I receive a small commission to help support this website.